To help you find the Best Guitar Lessons, TopConsumerReviews.com provides you with an in-depth comparison of Learn & Master and Jamorama. Gibson Guitars, a leader in fretted instruments, has partnered with Legacy Learning Systems and instructor and professional musician Steve Krenz to produce a guitar lesson DVD series called “Learn and Master Guitar”. The system uses four modes of learning: reading, listening, watching, and doing. The easy-to-use program of self-directed study progresses from beginner through advanced lessons on 20 DVDs of instruction, 5 “jam along” CDs, a 100+ page workbook, and an online community of learners and instructors. The Telly Awards-winning DVDs contain over 40 hours of lessons in HD video format with clear, well-demonstrated techniques and practice drills. The topics that Learn and Master Guitar covers start with the basics and move through advanced techniques. 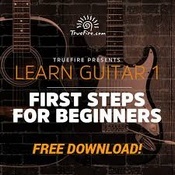 Starting with the Foundational Techniques lesson, which teaches how to hold the guitar and picking and strumming, you’ll move on to the Basic Chords lesson followed by the Advanced Chords lesson which teaches barre chords, two chords, major 7th and minor 11th chords and so on. The lessons on Advanced Electric Guitar Techniques teach Hammer-Ons and Pull-Offs, Advanced Bends, and the Eddie Van Halen Technique. Then it’s on to the Mastering the Entire Guitar lessons in which you’ll learn more about how to fully use the whole fretboard, reading music and tablature, ear training, alternate chords and chord creation, and many other topics. The Play-Along CDs, of which there are 5 total, provide tracks you can jam with as if you were in an actual band. The tracks are recordings of actual professionals playing real guitars and are not MIDI or computer-generated tracks. You’ll feel like you are in a real studio. You can even control the volume of the recorded guitar part by adjusting the balance controls on your own playback device. A lesson book comes with the DVDs in case you want to practice without the DVDs and CDs. An online community of over 15,000 users is available for student support. The video instructor, Steve Krenz, logs on regularly to field questions and give answers. If at any time in the first 60 days of using the DVD series you decide that it isn’t working for you, you can get a full refund. Learn and Master Guitar’s use of DVDs in place of online learning is due to its claims that this method of instruction is superior to “thirty-minute videos” found online. They also claim that software-based instruction chains you to your computer in a way that detracts from learning well. This may be true in some cases, but it ignores the new reality that not all online lessons are so limited. People who are mobile learners may not want to lug 25 DVDs with them wherever they happen to want to use the lesson materials. If you want a guitar learning system that is composed primarily of DVD and CD media, then Learn and Master Guitar is a good option. But if you want to use the more sophisticated and interactive learning and feedback modes provided by software-based solutions, look to other programs.